We used to have a projection like this incorporated into the timeline, with 'yottaflop' computers somewhere about mid-century; but we removed it, since this sort of prediction about computer size and speed assumes a steady rate of innovation, something that need not be the case in OA (sometimes it is slower, sometimes much faster). 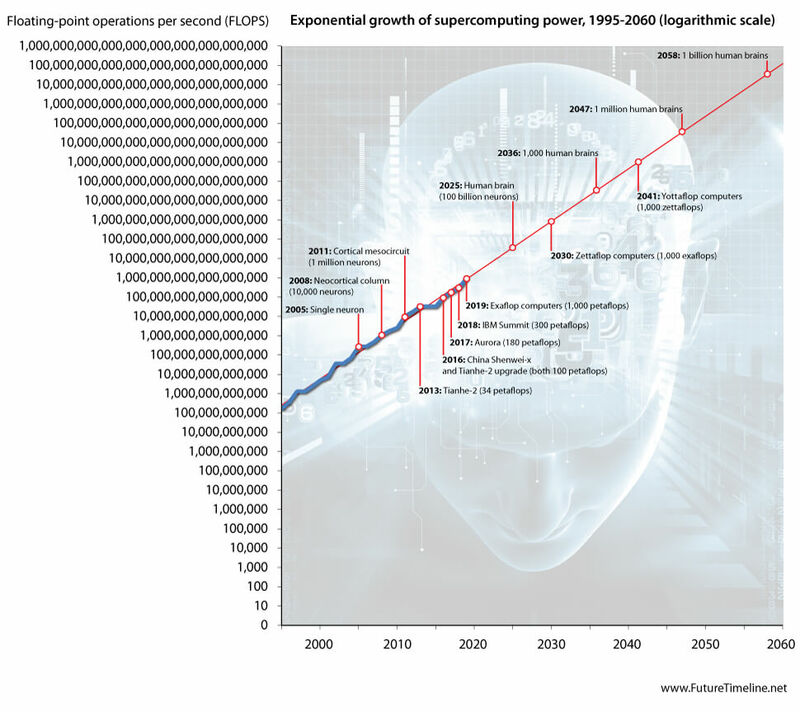 (10-11-2016, 04:26 AM)stevebowers Wrote: We used to have a projection like this incorporated into the timeline, with 'yottaflop' computers somewhere about mid-century; but we removed it, since this sort of prediction about computer size and speed assumes a steady rate of innovation, something that need not be the case in OA (sometimes it is slower, sometimes much faster). How realistic is the chart? It's not just the assumption of permanent exponential growth that is the problem with these charts. They also assume the action of the brain can be measured in FLOPS (dubious at best) and that raw computing power equates one-to-one with AI. Charts like this are largely pointless IMO and definitely misleading. OA does assign a certain amount of processing power to the human (or equivalent) brain. But we also presume that it is not a matter of pure processing power and nothing else. Rather it is a matter of how that processing power is organized. The software in other words. And that software is partly a learning neural net type system, although the higher S-levels can 'top down program' lower minds to a greater or lesser degree. Basically, raw processing power alone doesn't automatically mean human level or superhuman intelligence. Obviously, with faster and larger computers it would be easier to emulate a human brain, or indeed any other biont brain; it would presumably also be easier to create the sort of non-human AI entities we have also discussed in this forum. If we are going to emulate the strange, leaky, permissive state of a neuron and its synaptic connections we would need as much processing power as we can get.